I really enjoyed this book the first time I read it, and have read it a couple times since and enjoyed it as much. I've not read Lirael yet, or anything else by Nix, but I keep meaning to. The ideas and execution were particularly well done, I though. I have been listening to that series on audio. 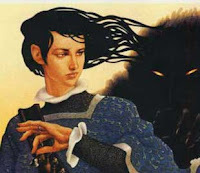 I just finished Abhorsen and they were all so good. I read Sabriel only a couple of months ago but absolutely loved it. I've been unsure of whether to read the follow ups though. I think I have problems with reading books that follow characters later in time than the first book. Ugh, dilemma. Thanks for posting about it! I have a hard time knowing which fantasy books I would like just from reading the blurb since fantasy is kind of hit or miss for me. I'll have to keep this one in mind though since everyone seems to like it so much. I did like Sabriel, but the second book lost its "magic" for me. have seen this around and haven't read it yet. you're review has got me curious to pick it up. I have always wanted a chance to read Sabriel. Thanks for your review, it makes me want to read it even more! I hate to say it, but I'm not a big Garth Nix fan. I read a couple of his... um, the falling ones. I don't remember their names, and I tried to read one called... Sandwitch? But I couldn't get into it. Maybe I'll try Sabriel, though!